You’re now looking at the largest-capacity alignment lift we make. 18,000 lbs. of lifting power is made possible by manufacturing our cable sheaves, base columns and base plates to be as robust and durable as possible. Of course, it’s all 100% ALI Certified for your safety. When you need to align truck wheels, BendPak’s free-floating slip plates and galvanized steel turn plates make the job easy to get done right the first time. BendPak’s largest-capacity alignment lift easily accommodates vehicles up to 18,000 lbs. Of course, it still services smaller sports cars and race cars without a problem. If your shop is busy and can’t afford the space for multiple lifts, you’ll need the extra lifting power to be ready for those lager trucks and SUVs. The HDS-18EA offers the same safety features and rugged design as every other car lift we make, from the aircraft-quality steel cables and enhanced cable sheaves to the adjustable locking heights and slack-cable secondary lock system. You’ll also enjoy the best warranty money can buy, which makes this ​auto lift the very best value of any alignment lift, anywhere. Full stop. BendPak’s galvanized and corrosion-resistant front-alignment turn plates feature dual recessed turn plate pockets that position your turn plates to help position your vehicle with very little effort: your equipment installations (i.e. 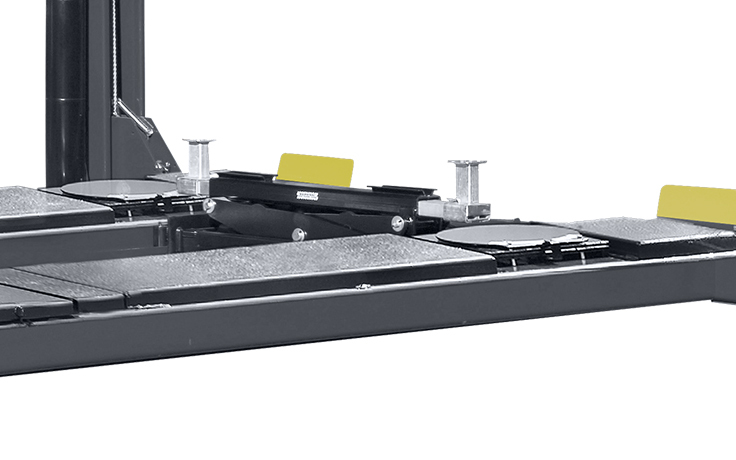 3D alignment pads) can be managed breezily. BendPak’s cable sheaves are world-class and over-engineered to function for years as though they were brand new. Simply picking up and holding one of these sheaves is convincing enough to see they’re not going to wear out any time soon. Not simply molded chunks of steel to route the cables, they’re heavy, massive and virtually immoveable when installed within the structure. We call our 12" diameter cable sheaves “supersized” for a reason. They’re located with within the runway along with equally impressive 4" diameter sheave axles. 1/2” diameter, 6 x 25 aircraft-quality stainless-steel lifting cables do their part to make our alignment lifts some of the most robust lifts ever constructed. These cables hoist your lift in the air in just seconds. They’re internally routed, but you can still see the runway through the open side of each column. This lets you see for yourself that BendPak cables remain lubricated during each use and rarely, if ever, show signs of wear. With the locks in place, it’s easy to release them again and get the car lift platform moving. A pneumatic lock release is activated with the push of a button, and it targets all four locks at once. Stainless steel and aluminum pneumatic cylinders keep your truck lift working for many years of reliable service. Click the button below to add the BendPak 4-Post HDS-18EA 18,000-lb. Cap. Alignment, 4-Post Truck Lift to your wish list.